Taipei, Taiwan – November 12, 2018 – AVer is proud to announce the acknowledgement that five AVer products have been awarded with Taiwan Excellence Awards for outstanding product development. On top of this, AVer has been a Taiwan Excellence Award winner every year for the past 10 years and has been recognized as a Taiwan Excellence Achievement Award recipient with over 50 products having been designated for their outstanding design. The winning products came from all of AVer’s product lines and included: the VB342 All-in-One 4K Video Soundbar, the PTC500S Professional Auto Tracking Camera, the PTZ330 Premium PTZ camera, the U70+ 4K Visualizer, and the engaging CP864i Interactive Flat Panel (IFP). The AVer VB342 is a fully loaded, all-in-one 4K video soundbar that lets businesses, governments, and teams connect and collaborate without ever needing to leave the office. 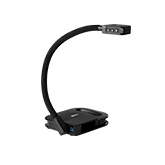 Fitting perfectly in an office’s huddle or small meeting room thanks to its all-in-one design, the VB342 provides users with a no mess plug-and-play video conferencing experience that allows teams to start their meetings quickly, easily, and with minimal cord connections required. Building an innovative and easy to use content capturing infrastructure for your business has never been easier with the AVer PTC500S Professional Auto Tracking Cameraand the PTZ330 Premium PTZ Camera. Offering true target tracking functionality and three unique tracking modes for business and public conferences, speeches, or events, the PTC500S is capable of accurate, professional video in any environment without the need for a professional video operator. The PTZ330 makes your video capturing easier by saving you time and effort with AVer SmartFrame auto-framing and SmartShoot preset tracking technologies for premium video quality. Bring the classroom to life and create engagement with the CP864i IFP and U70+ Visualizer. Teachers can instantly engage with students through the CP864i’s built-in screen sharing and an easy-to-use android operating system that provides a familiar UI for both learners and educators. Connect and share digital material or student work directly to the CP864i at the front of the class for everyone to see with AVer U70+ Visualizer compatibility. The U70+ provides superior presentation capabilities with crystal clear 4K visuals and fully integrates with the A+ Suite Classroom Software so students can see and learn every detail in a class. The AVer CP864i and U70+ help transform the classroom into a digital atmosphere so students can get the most out of their school day.